Back in the olden days, before the great age of boardgames we live in now, we didn’t have all that many choices per genre. If you wanted to play a party game, for instance, more often then not you’d end up playing Taboo. If you’ve never heard of Taboo – and I find that hard to even imagine – it’s a word guessing game. 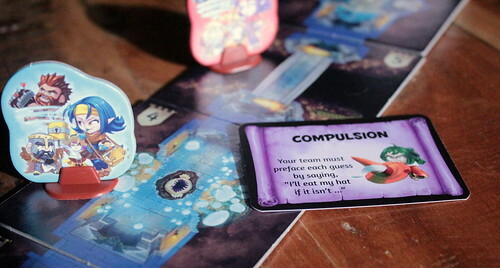 You play in two teams, and every turn one member of your team draws a card with a word they have to paraphrase and explain for their teammates to guess. Making that task more difficult is the list of five other words that they can’t use in their explanation. If they do, the other team will hit the very annoying buzzer and that’s the end of that round. I never really enjoyed Taboo much. Once you develop an instinct which words are likely to be banned, it’s actually pretty easy, there are always some people that want to keep playing after I got way bored already, and that buzzer is super annoying. So imagine my lack of enthusiasm when Czech Games Edition announced a game that sounded for all intents and purposes like Taboo with a fantasy theme sprayed on. Then I actually played Trapwords. In very, very rough outlines, Trapwords is similar to Taboo as described above. Two teams, one player explains a word, the others guess, bad words lose round. Beyond that there are some important differences. For one, you have the framing dungeon scenario. Two parties move through a dungeon of five rooms to defeat the boss at the end. When your party guesses a word their little paper standee moves one room forward. If neither party guesses their word for the round, the monster moves towards them. 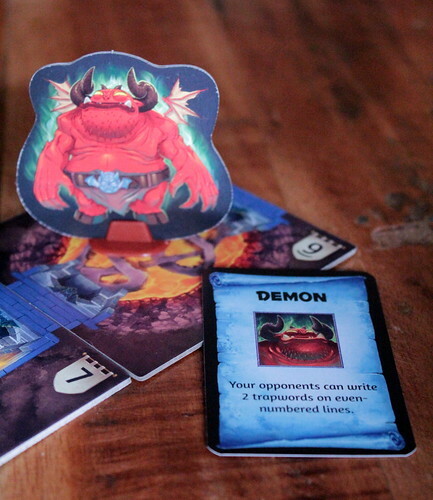 If neither party could defeat the monster after eight rounds the monster wins. Eight rounds is also all that fits on one game sheet, so you have enough reasons to end the game when it’s supposed to be over. An even bigger upside of the whole dungeon thing is that some rooms have curses. The first round in that room you’ll suffer from the curse, for everyone’s entertainment. Just as an example, if the room has the Feeblemind curse the clue-giver is only allowed to use nouns. With the Petrification curse the clue-giver must stop speaking as soon as his team makes the first guess. Fighting the monster works the same way, each monster has two special abilities, one of which will be randomly selected each game. Fighting a Dragon might mean you only have one guess to get the word. Yikes! I know it doesn’t sound like much, but those little changes make the game so much better already. And I didn’t even tell you about the big change yet. In Trapwords, there is no fixed list of forbidden words that go with a word to guess. The opposing team makes it up. The further delve into the dungeon the more words they may put on that devilish list. You don’t believe that’s a big change? Well, read on then. The opposing team making up the list of banned words changes everything about what might have been yet another word game with a cute framing story. It adds psychology. Describing bee as a hippie wasp always worked in Taboo, but opponents that know your style of explanation might have put wasp and hornet on the list. And this round they can only trap three words, so maybe saying “An insect that lives in a hive,” is safe. But maybe they thought you would anticipate them trapping wasps and hornets, so they could have put insect, hive, and honey on the list, after all. And while you’re thinking that through, the timer is running. Because of course there is a timer. This interaction makes Trapwords incredibly satisfying for both teams. Correctly anticipating how the clue-giver would explain a word is just as awesome as artfully evading the other team’s traps. I’ve never played another word guessing game where I’d applaud the other team’s clue-giver. Avoiding eight traps that our whole team thought covered all the bases while only using nouns, though? That’s impressive, no matter how you turn it. The dungeon setting, curses, and monsters are fun, but it’s the simple team interaction that puts Trapwords on a different level from similar games. Beign shipwrecked is bad. Being shipwrecked on a deserted island is worse. Being shipwrecked on the Cursed Island? That sounds like trouble. Enough trouble, actually, that we should all work together. And here we are in Robinson Crusoe: Adventure on the Cursed Island, a cooperative adventure game. While Dominion inherits a lot from the TCG genre, it skips the whole “collectible” part and makes deck building part of the entertainment. Games about making dresses are a tough sell. Between games about conquest, economic success and survival, tailoring just doesn’t compare. So to stand out, a game about making ballroom gowns needs to excel in other areas. Having well linked games mechanics and a new take on deck-building might do the trick for Rococo.